Libby's Little Addiction: July 2018 My Monthly Hero - Release Blog Hop + Giveaway! July 2018 My Monthly Hero - Release Blog Hop + Giveaway! It's My Monthly Hero release day over at Hero Arts! This month's kit is so much fun - it's a trip to the county fair! For my project today, I played with some of the optional add-ons to the kit. Isn't this carousel horse the cutest? The set has three different carousel creatures - a regular horse, a sea horse and this beautiful unicorn. The set is called Ornate Carousel. Ornate, indeed. I colored it with my Copics, then coated a bunch of the areas in gold Stickles (which may have been still wet when I photographed this - oops). It has matching frame cuts, too - but I tortured myself with fussy cutting. The other awesome new product I used is this absolutely gorgeous Marquee Frame die. It was cut from sold gold cardstock, and is a total wow factor. The subtle background behind the carousel is the new County Fair Bold Prints, stamped in Bubble Gum ink and then covered with a piece of Classic Vellum Layering Paper. For my next card, I wanted to show you the yummy new color of Liquid Watercolor - PINK!! So many have been wanting a pink added to the collection, so I'm pretty excited about this. 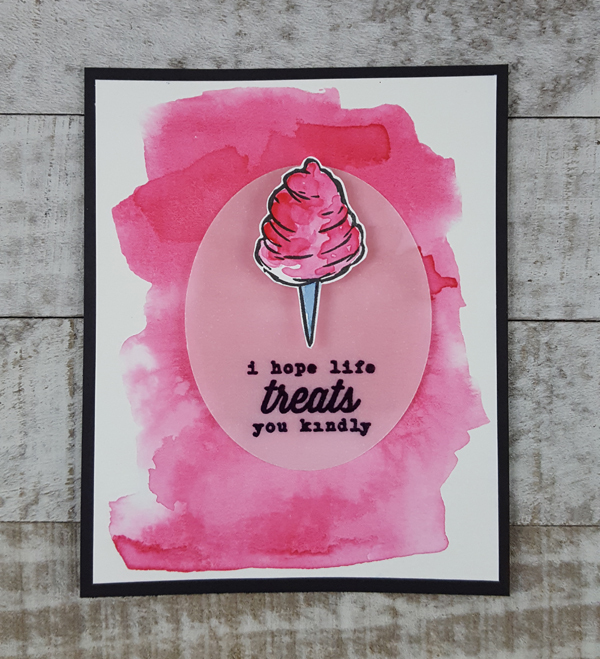 I created the quick background with a bold wash of the pink liquid watercolor, and then also painted in the cotton candy from the add-on set You're Sweet As Pie with Pink, as well as Indigo for the cone. The message from the stamp set was embossed in Detail Black Embossing Powder, and die cut with the Nesting Oval Infinity Dies from Classic Vellum Layering Paper. Now it's time to hop! We're got a great hop list this month, full of inspiration. And if you missed the countdown posts on the Hero Arts blog, they had tons of ideas for using the stamps from the main kit. And like every month, there's a giveaway - be sure to comment on every blog in the hop, and a lucky winner drawn from the comments will receive a free kit! Very awesome card! Love the gold frame. Great contrast between cards. One was so elegant, and the other so playful. Great job. Love your glitzy carousel and the fun cotton candy. The water colored background and vellum center really makes the focal pop. WOW....I'm head over heels for that carousel horse! It's A-MAZ-ING!! The pink watercolor is such a beautiful shade. Perfect for cotton candy! I adore the golden frame card! They are all absolutely beautiful! Amazing job! These cards make me think of summer fun & carnivals. Really cute! I really liked that pink liquid watercolor background and that cute cotton candy card. So sweet! You are right! That gold frame is a total wow! Beautiful cards. Oh gosh! I’ve been waiting to see the gorgeous frame used in a card. Beautiful done up in gold. Fabulous card. Thank you! Your Ornate carousel card is so beautiful. The gold faux frame really keeps with the antique theme. Gorgeous work! The first card is so elegant and gorgeous! 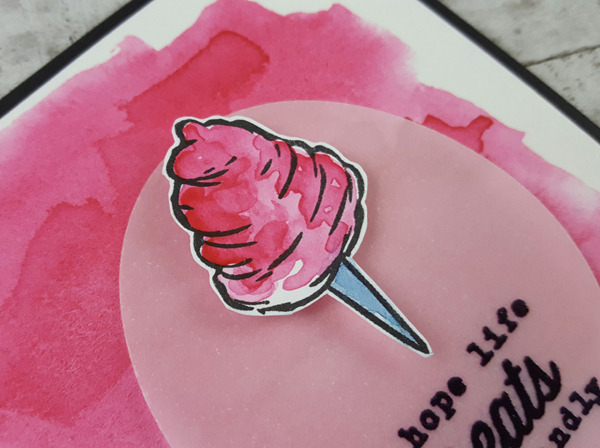 Love the yummy color used on the ice cream card. Your first card is so beautiful and elegant. AMAZING CARDS! I can't decide which one is my favorite! The Cotton Candy one looks good enough to eat! And that Carousel is GORGEOUS with the Pinks and Golds and Yellows!!!!! Absolutely stunning! The frame is the perfect touch. Super designs! I love the cotton candy! Wow! That first card is a stunner! Can't wait to get my hands on that carousel stamp set!!!!! I LOVE your cotton candy card! Great cards - love that gold frame! And the new kit looks like another winner from Hero Arts! I was up in the air about the frame until seeing this, but wow does it make the card even more fabulous! Love your cotton candy card too. Great cards. Great gold frame. The gold frame die IS stunning. I didn't realize how awesome it would look until I saw it made up on your card. It really goes so beautifully with the carousel image. Stunning cards, I love the gold frame. Fun kit and beautiful card creations! Hi, this blog hop is so much fun. I love all of the different ideas that everyone has....what a mass of talent.....Your cards are great......it is such a fun Kit....Hope I win one....thanks so much for sharing. Wowzer! I truly love your cards however the carousel isy favorite! Love the colors and the gold is just the icing on the cake. Great job! Love your cards, well done! Beautiful cards!!! Love the frame on the first one and the cotton candy is adorable!!!!! Wow, what an eye popper your first card is - that's amazing Libby. The frame is beautiful and so versatile for so many cards. Awesome cards - love that Marquee frame! This kit has so many great elements ! Especially like the framing of this. Like carousels. The gold frame is fabulous! Awesome Libby! LOVE all that glorious gold on your first card and your second one is so SWEET. Love these cards. The first one is so elegant and the carousel add-on is gorgeous. The second is so fun. I love this release. Carousel....Elegant. You took this card to a new level of awesomeness!!! Love these cards! The gold frame is beautiful and the new pink color is gorgeous. Nice cards. The cotton candy looks good enough to eat. I love the ornateness of the 1st card and the good feel of the 2nd one! The gold reminds me of a museum frame. Beautiful cards! Fantastic cards! The first absolutely captures the opulence of a carnival. Wow! Gorgeous cards! I love how elegant the first one is with the gold frame and the second one the background truly matches the look of the cotton candy! Thanks for the great inspiration! Fantastic cards! I love your carousel horse! Your cards are too cute! These are wonderful! I love the style of the cotton Candy card, nut the ornate one is so fancy and fabulous! Great cards! 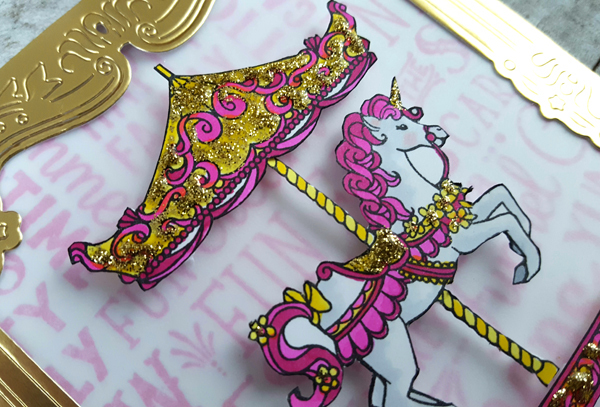 I love the color on the second one and the gold stickles on the carousel is spectacular! so super cute! That gold frame is gorgeous and I Love the pink cotton candy! The gold frame on the carousel card is stunning! And that cotton candy looks so yummy! your cards are amazing and super beautiful! Wow--so pretty with the gold framing and I like the background for the cotton candy. Wow! Wow! Wow! This kit is really wonderful like your first card!!! Adorable and yummy ice cream card too!!! Wow! The cards are Looking elegant! You made me NEED that frame! Love these two cards Libby! The gold frame simply stages the carousel so perfectly. And your use of watercolor with the cotton candy was brilliant! Thanks for sharing your talent! WOW! 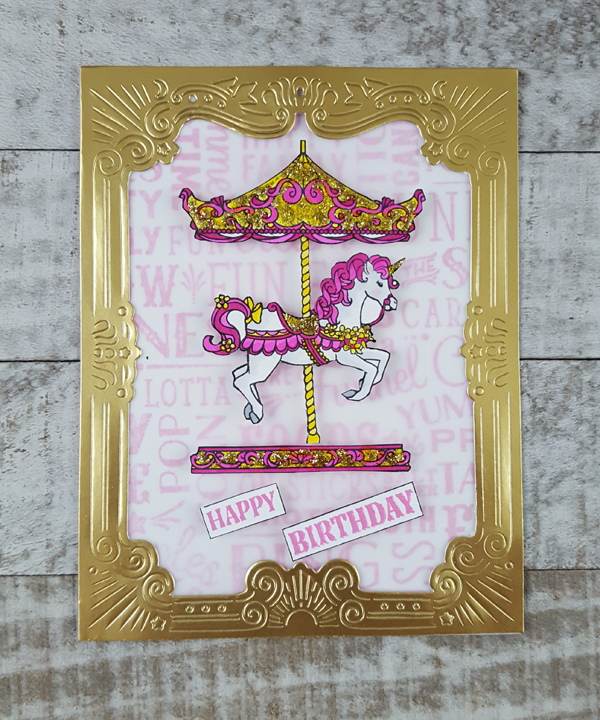 I love the gold frame and the glitter on your detailed carousel horse! Your pink watercolor is gorgeous, too. Great use of the collection! The beautiful way your framed the ornate horse with the gold embossed frame is fabulous!! Beautiful pink splash with the cotton candy looks so yummy too!! Great inspiration and so creative! The framed carousel horse would be great to hang on the wall. What a fun watercolor background - that pink color is perfection! These are beautiful, Libby! 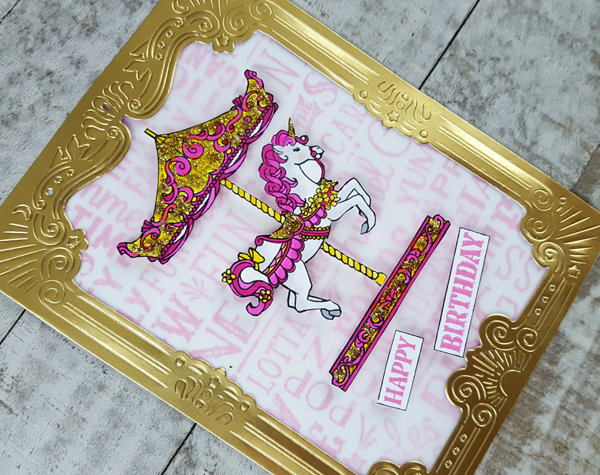 I love the gold foil framing around the carousel horse- great idea and really fun too! Oh my, the gold frame and the pink, stunning! Love your carousel horse card, and now I want cotton candy! Great projects. Such great cards. Love the carousel! Love the elegant carousel card. Both of those are bold and beautiful! Beautiful cards. Love that pink watercolor! Another amazing release. Just stunning. Great patterns, coloring and designs. I just love it, so fun. Wow! That ornate frame die looks amazing cut out of gold card stock! Very nice cards! That frame looks really great in gold and around the carousel horse. Such nice detail on the horse. Your cotton candy card looks great too!